Last night, the Academy of Country Music Awards audience was filled in on a secret that This Is Us fans have known for years: Chrissy Metz is too good of a singer to ignore. Before last night, Metz had never sung on live television — though her This Is Us character, Kate Pearson, has demonstrated her singing talents many times over. At the ACM Awards, Metz performed an emotionally stunning rendition of “I’m Standing With You,” from her upcoming movie Breakthrough. 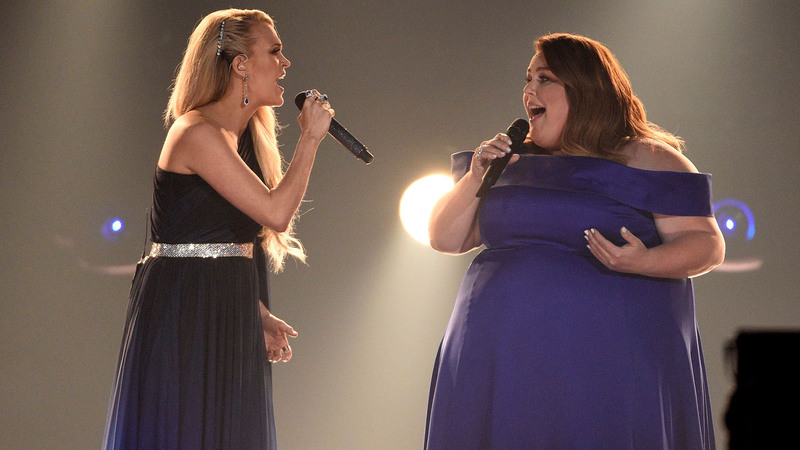 And she wasn’t alone up there: country music stars Carrie Underwood, Lauren Alaina, Mickey Guyton and Maddie & Tae all joined in on her performance, making it a truly unforgettable number. Metz took to Instagram Monday morning to share her continued gratitude. “Singing this song with such wonderful women, artists and this amazing choir was truly a gift wrapped in the most special of bows!” she writes, before thanking her co-stars and the rest of the Breakthrough team. If you’re craving more of Metz’s singing, Breakthrough comes out Easter 2019. Until then, we’ll just have to content ourselves with re-watching old episodes of This Is Us — although, given the overwhelming reaction to Metz’s performance last night, it wouldn’t be surprising if she picked up a few new musical projects this year. Maybe even (*crosses fingers*) an album of her own? A girl can dream.